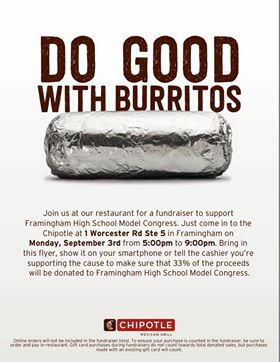 FRAMINGHAM – The Framingham High School Model Congress is holding a fundraiser at Chipotle on Worcester Road on Labor Day, from 5 to 9 p.m.
“As a club we focus on creating a welcoming environment in which we develop bipartisan debate and political knowledge. Throughout the year our members get numerous opportunities to use their debate skills and political knowledge such as our yearly trip to Yale University’s Model Congress Convention in December. As you can imagine this trip becomes rather costly and the club must put a large amount of focus on fundraising to make the trip attainable,” aid President Victoria Boyne.